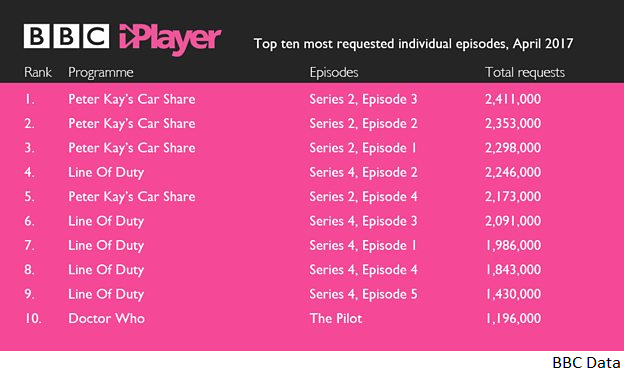 Peter Kay’s Car Share, Doctor Who and Line Of Duty helped the BBC iPlayer achieve a 23% year-on-year increase in requests. The three series made up the entirety of the top ten most-requested episodes in April. Four-part comedy series Peter Kay’s Car Share was the month’s most popular programme, with all four episodes in the top five rankings and all episodes achieving over 2m requests each. The new series of Line of Duty saw five of its six episodes in the top ten ranking, while there were more than one million requests for the Doctor’s first episode back, The Pilot. BBC iPlayer is currently moving towards providing access to registered users only. Data will be used to provide users with personalised recommendations, but can also be used to reduce licence fee evasion, according to a recent BBC blog.